Multiple plots can be displayed in a single notebook output cell by calling show() multiple times in the input cell. The plots will be displayed in order. 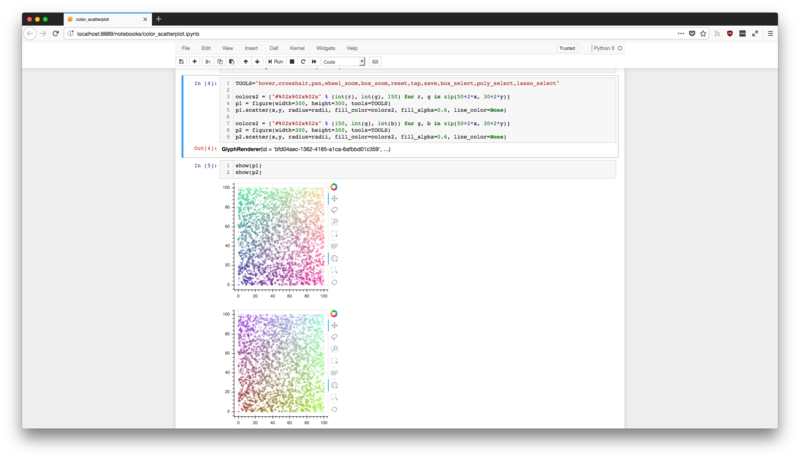 In order to embed Bokeh plots inside of JupyterLab, you need to install the “jupyterlab_bokeh” JupyterLab extension. 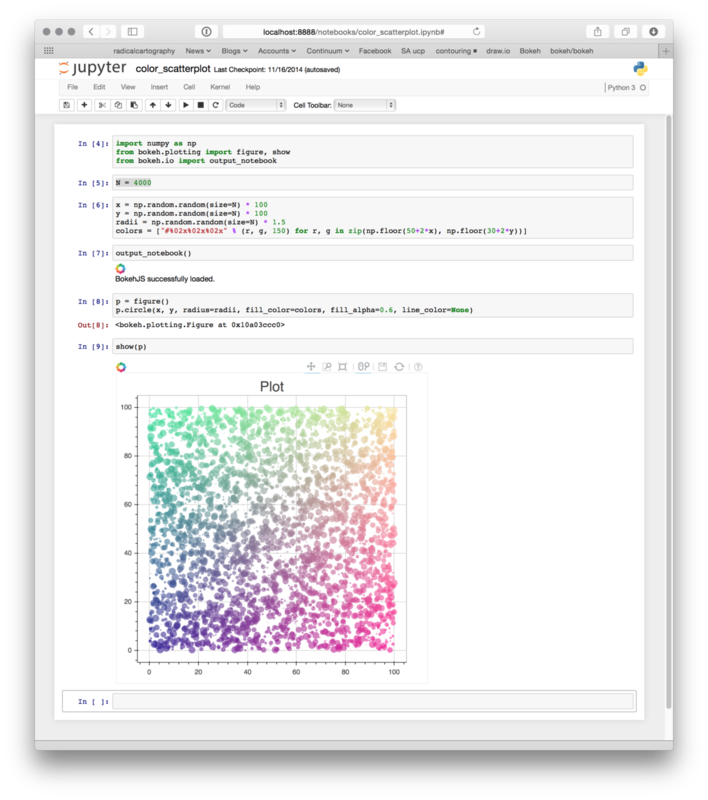 This can be done by running the command: jupyter labextension install jupyterlab_bokeh. In order to embed Bokeh plots that don’t use the Bokeh server, you can follow instructions contained in the JupyterLab section and stop there. If you want to use the Bokeh server, run the JupyterLab instructions then continue with the following instructions. 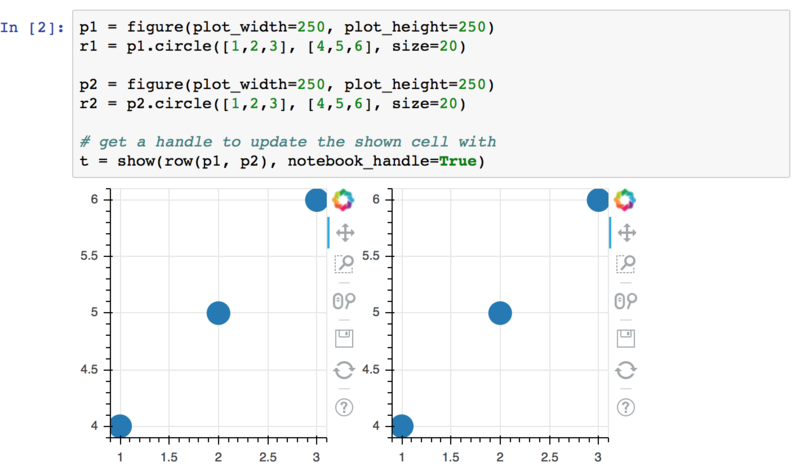 If you want to run a Bokeh plot that utilizes the python-based Bokeh server, there are some additional steps you must follow to enable network connectivity between the client browser and the Bokeh server running in the JupyterLab cell. This is because your browser needs to connect to the port the Bokeh server is listening on, but JupyterHub is acting as a reverse proxy between your browser and your JupyterLab container. First, you must install the “nbserverproxy” server extension (requires python3). This can be done by running the command: pip install nbserverproxy && jupyter serverextension enable --py nbserverproxy. Second, you must define a function to help create the URL that the browser uses to connect to the Bokeh server. This will be passed into show() in the final step. A reference implementation is provided here, although you must either modify it or define the environment variable EXTERNAL_URL to the URL of your JupyterHub installation. By default, JupyterHub will set JUPYTERHUB_SERVICE_PREFIX. # so return the public hostname. 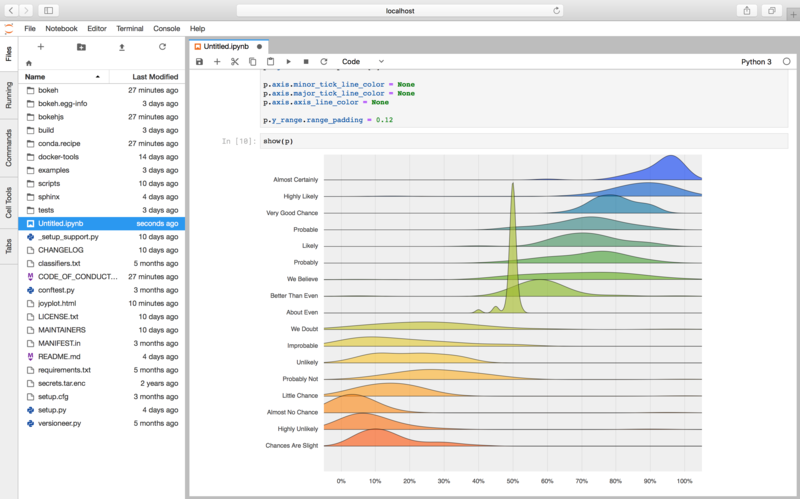 At this point, the Bokeh graph should load and execute python callbacks defined in your JupyterLab environment. The cell containing output_notebook must not be skipped. The rendered cell output of the output_notebook call is responsible for making sure the BokehJS library is loaded. Without that, Bokeh plots cannot function. If this cell type is marked “skip” then BokehJS will not be loaded, and Bokeh plots will not display. An alternative, if you wish to hide this cell, is to mark it as the “notes” slide type. It is possible to update a previously shown plot in-place. When the argument notebook_handle=True is passed to show() then a handle object is returned. This handle object can be used with the push_notebook() function to update the plot with any recent changes to plots properties, data source values, etc. 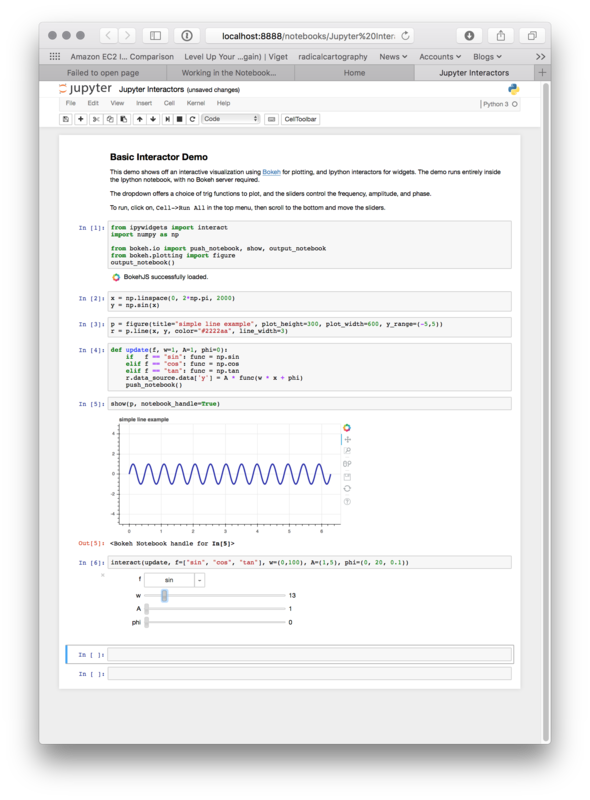 This notebook handle functionality is only supported in classic Jupyter notebooks and is not implemented in JupyterLab or Zeppelin yet. The following screenshots walk through the basic usage of notebook handles. 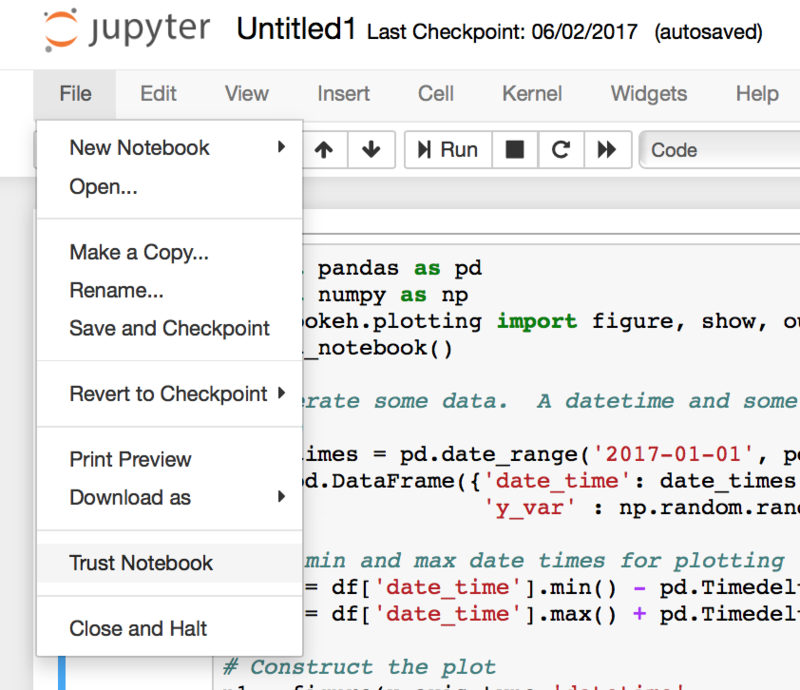 Then launch Jupyter Notebook in your web browser. Alternatively, live notebooks that can be run immediately online are hosted by Binder.